If anyone is entitled to writing about achieving goals, it would be a three-time Olympic rowing champion with three gold and one bronze medal as testament. In The Power of More, Marnie McBean translates her infectious energy into a book that is the equivalent of verbal Red Bull. There is an instant pep rally momentum to her easily digestible subtitle: “How small steps can help you achieve big goals.” We are introduced to the mental physique of a retired athlete who has already proven her physical endurance — and her continued high-octane enthusiasm to be better and more is contagious. Humbling anecdotal moments where McBean admits nearly quitting, failure, disillusionment and frustration quickly level the playing field. She’s normal, she’s human. The purpose of The Power of More is not to clone a herd of Olympic champions. Instead, McBean blueprints success in a very generalized and far-reaching approach: for relationships, recreational or elite runners, the workplace and beyond. A sales rep and stay-at-home mom will find equal education and motivation in her words. If you find yourself stalling, waiting for the perfect time to begin a daunting project or conversation (like Monday or New Year’s Day), her book will leave you fumbling for previously reliable excuses. “The inertia of doing nothing can be very difficult to overcome,” she admits. But, as the law of inertia dictates, “a body in motion tends to stay in motion.” Where are you now? Where do you want to be? Why are you not moving in that direction full force? McBean addresses the inevitable duality that symbiotically occurs in the pursuit of a goal or dream. Patience, impatience. Satisfaction, dissatisfaction. The tangible moments of contentment are so fleeting. Reaching the podium to accept a gold medal doesn’t even squash this turbulent human condition. We inherently want more and the undercurrent of power that works in tandem with it is what keeps us on a path of continual learning, growth and achievement. When McBean decided she wanted to be the best rower in the world and win at the Olympics, her ambition solidified her accountability and commitment. Readers will be surprised to leanrn that she was originally inspired to contact the Argonauts Rowing Club in Toronto because of a chocolate bar commercial and a Rob Lowe movie (Oxford Blues) spotlighting rowing. This wasn’t a childhood dream — but as soon as McBean committed to the idea of being the best, she was unstoppable. There was no chalk dust in her goal. In accomplishing goals, McBean believes in accepting motivation from any source — even if it’s vanity. Her account of participating in the Canadian Eco-Challenge proved this theory. Her accountability shifted from the “fun of doing it for me to the task of doing it for my team’s perception of me” when lactic acid turned her legs into non-cooperative wet cement. Olympic champions don’t quit, right? Herein lies the successful balance in her guts and glory approach of mentorship. McBean breaks down the tough and instils invincibility in the reader by the gravity of her past stumbles. In turn, she poses squirm-inducing questions that deserve answers or, better yet, action. Threaded throughout The Power of More are nostalgic Olympic tidbits heavy on the Canadiana and marvellous McBean trivia (chess champion? Snowboard instructor? Climbed Kilimanjaro?). We eavesdrop on McBean’s early days before self-actualization and it’s in these honest admissions that her wisdom and strategies gain strength. 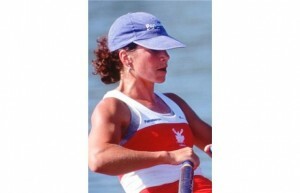 The communication dynamics with her rowing partner Kathleen Heddle provide the basis of many of her revelations on performance, resulting in an irresistible open diary about the suffocating pressure and euphoria of a world champion. After a 15-year career with the Canadian Rowing Team it seems only natural that she now specializes in athlete preparation and mentoring with the Canadian Olympic Committee. She is a sucker for a challenge and has success in a chokehold already. Need a hand to hold? A big nudge? A cheerleading squad? Listen to McBean. Four Olympic medals are proof that her plan and idealistic thinking works. Marnie McBean will be a CTV sports correspondent at the 2012 London Olympics.Jules Torti is a Toronto writer who believes she’d win gold if paddling upstream was an Olympic event.